Instant Issue of your Debit Card or ATM Card! Instant Issue debit cards are here! This means you'll be able to pick up a new debit card at either of our office locations. With Solidarity's Debit Card, you have the security of paying for items with a VISA protected card, but also the freedom of a standard check. 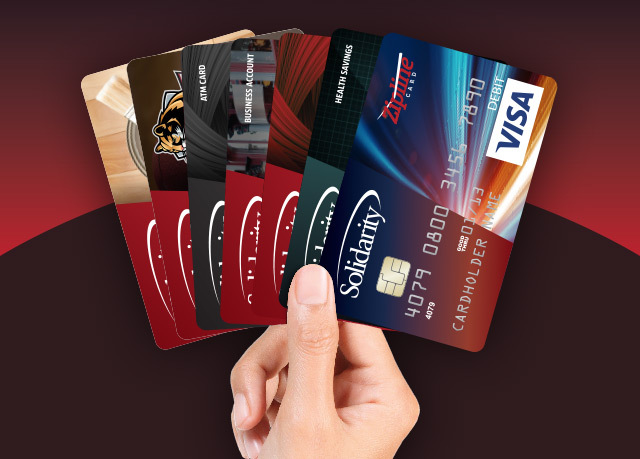 Solidarity members with a checking account will receive an EMV chip debit card immediately in either of our office locations. A Solidarity ATM is just a store away and most retailers provide cash back on debit cards. Any Solidarity debit or credit card can be a lot safer with Verified by VISA. A program that not only protects your online purchases; it protects your identity and credit. How? By using your Solidarity VISA online at specific retailers, you're asked for your Verified by VISA username and password. If someone steals your card and tries to buy something online at select retailers, they won't be able to use your card. Neat huh? Starting is as easy as 1, 2, 3! Spot the “Activate Now” link located on the right side of the page. (Input only the primary account holder’s information so VISA will know who is trying to activate the card). Walk through the steps, including new password generation and review of billing rights and fraud detection. Enjoy your freedom! Register your card for text message or email alerts when your card is used. Define custom alerts based on your spending habits! Find out more info at Debit Card Alerts Page! Interested in A Solidarity Checking Account?